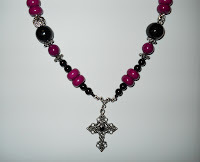 24" Necklace with Cross, Black and Cerise stones. 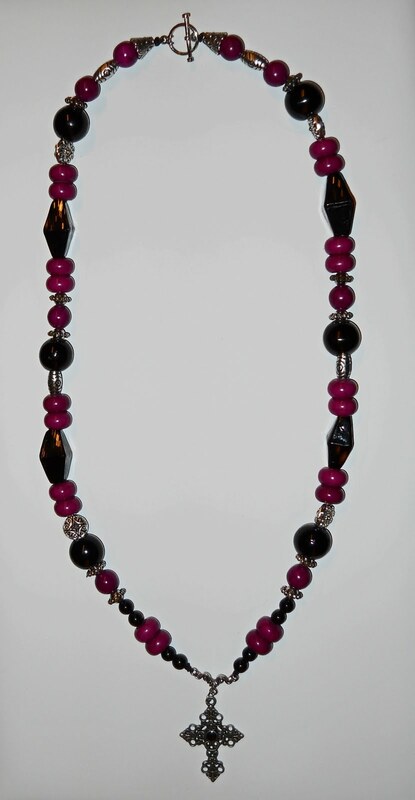 24" Hand Crafted Necklace with toggle clasp. 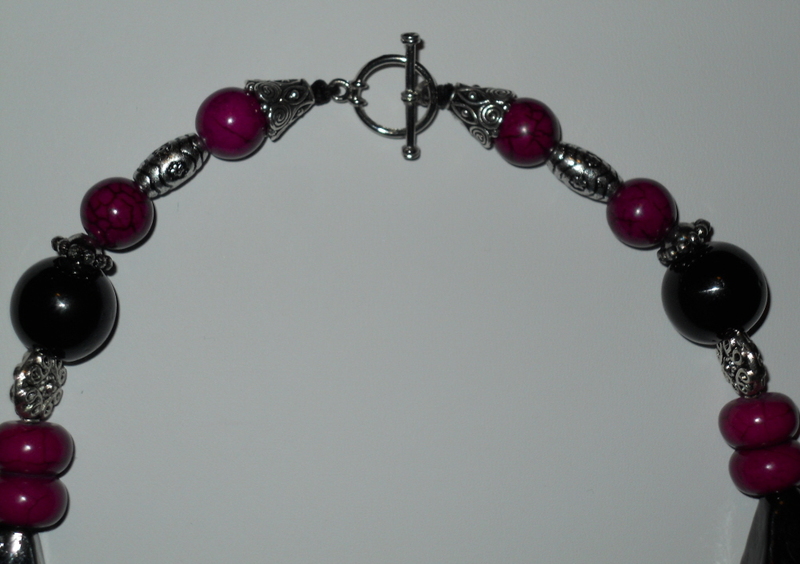 Stones are Cerise marbled with black and highly polished black stones. Silver plated spacers are used as accents. 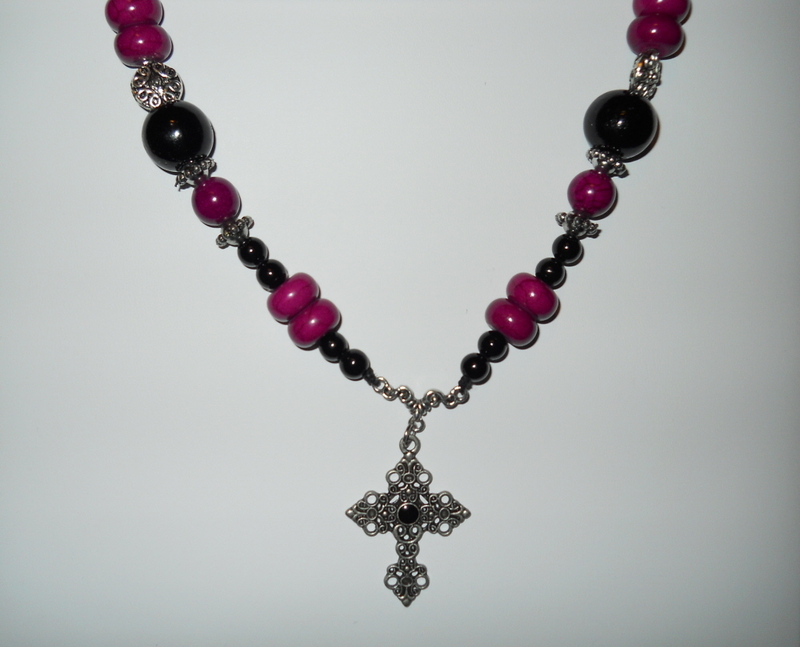 Pendant is a scrolled pewter cross with an Onyx stone in the center. Easy to get on and off. All of the items I design are unique. No duplications. You will own a one and only.I will refund your money promptly if you do not like the item you receive. 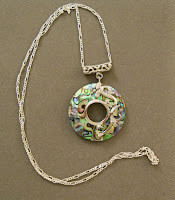 28" Gorgeous Necklace with White / Gold Swirled Murano Glass Pendant on White Braided Leather Cord. Extra long with Lobster Clasp. Easy to put on and take off. 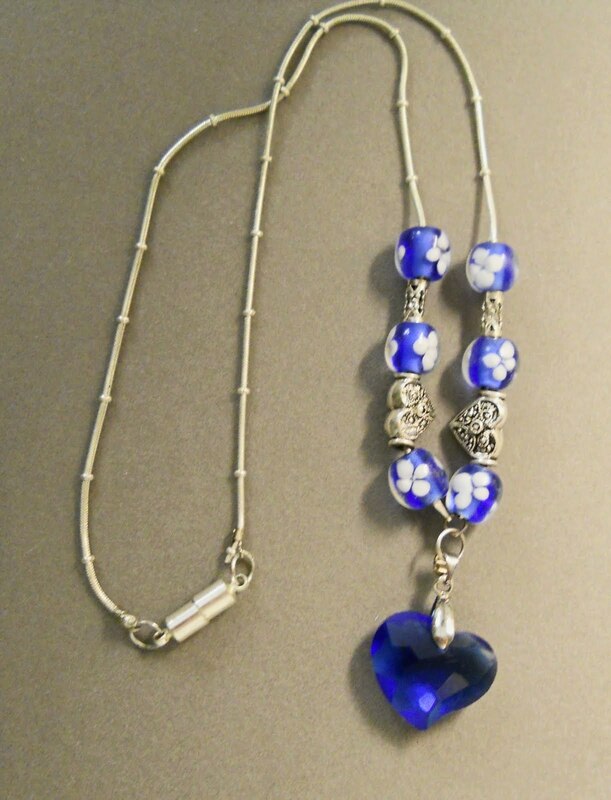 18" Neckclace with Swarovski Saphire Heart Pendant on a Silver Knotted Rope style chain. 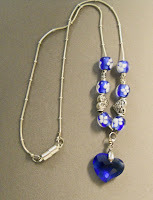 Adorned with blue and white Daisy Lampwork Beads and pewter spacers. Magnetic clasp makes this necklace easy to put on and take off. 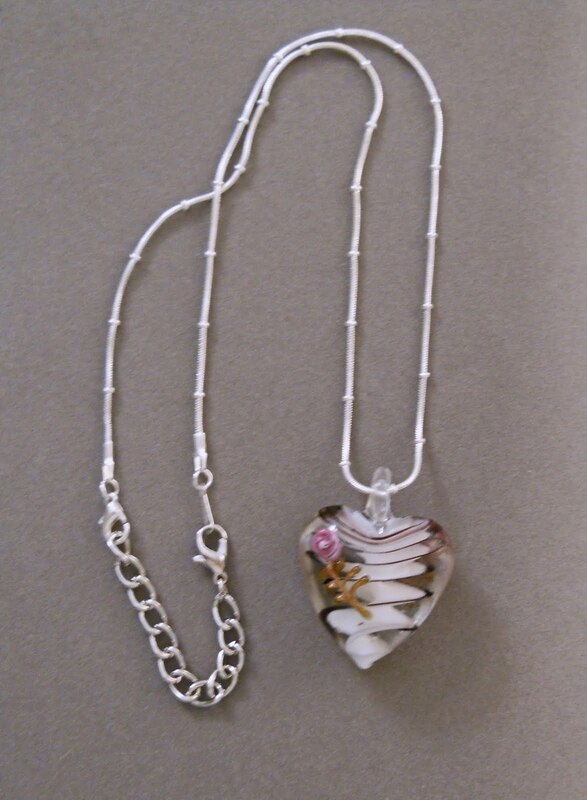 19" Knotted Silver Rope Necklace with Murano Lampwork Glass Heart Pendant. White and Purple swirled together with a Pink and Gold Rose decorating the outside. Chain extender makes it easy to change length and put on and take off with a Lobster claw clasp. 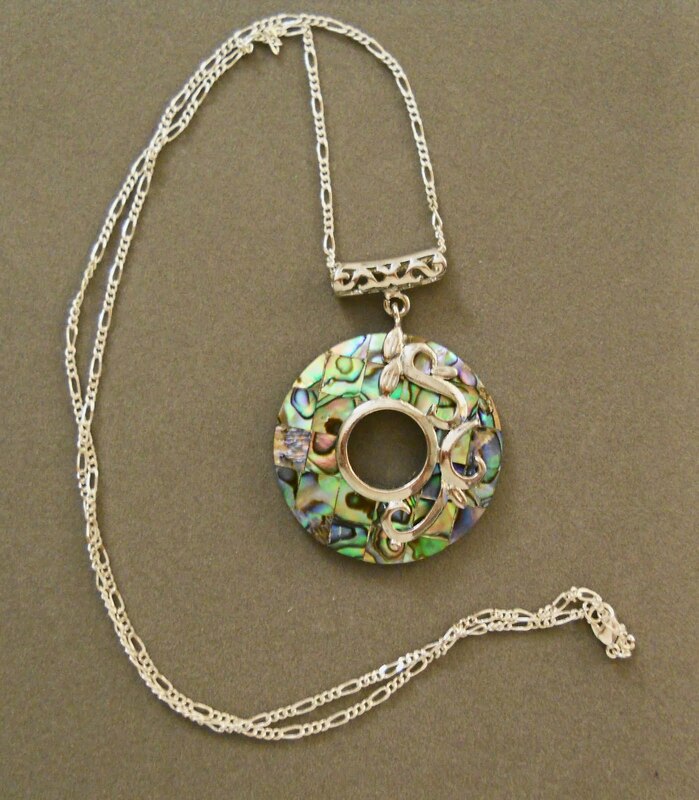 23" Stunning Silver Plated Chain Necklace with Abalone Shell Donut Pendant with Silver flourishes on a silver plated bail with a Lobster Clasp. Easy to put on and take off. 21" Gorgeous Murano Glass Heart Pendant with Blue and Black Swirls on a black velvet cord with necklace extender and S clasp. Easy to put on and take off. Adorned by 3 strands of different styles of aqua glass beads and silver plated spacers on each side of pendant. 20" Snake style smooth chain necklace with Lobster claw clasp. 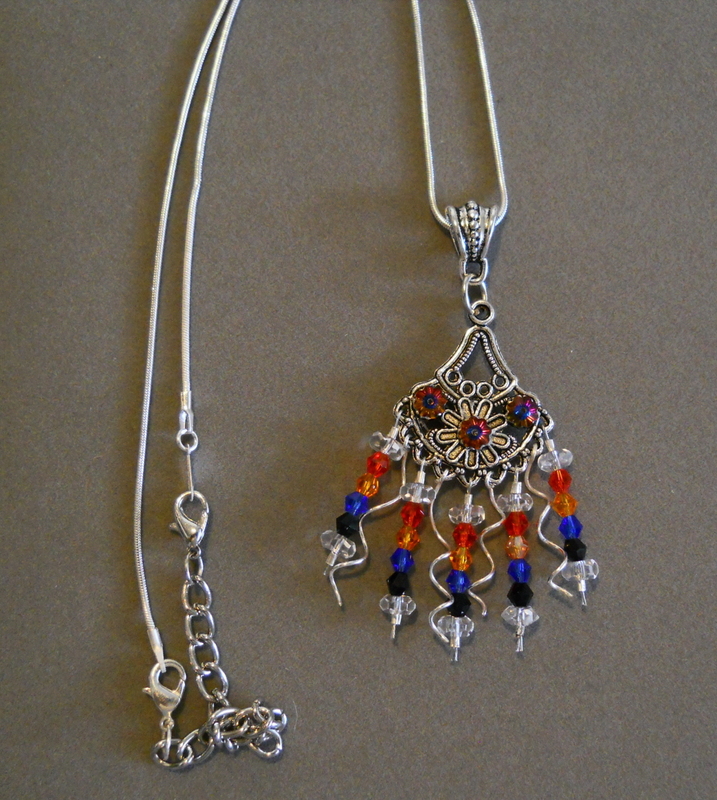 Tibetan Silver Filagree inlaid with Swarovski Volcano crystal and Swarovski crystals in red, orange, blue and black dangling down intermingled with curled silverplated heavy duty eye pins. 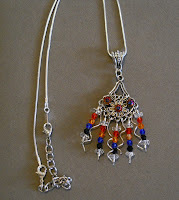 Chain extender so necklace size can be easily changed. I've been having fun lately learning about different types of jewels and styles. Here are the last two endeavors into designing my own style.